When my family packed up and left Melbourne 10 years ago, the only brewery in the city that wasn’t a massive commercial production was Mountain Goat, which existed out of a couple of sheds in the industrial eastern zone of Richmond, in the shade of giant CUB. They used to open up the doors maybe one Friday a month, put on a BBQ and a stack of locals would marvel at the astounding choice of two different hand crafted beers and a sausage in bread. 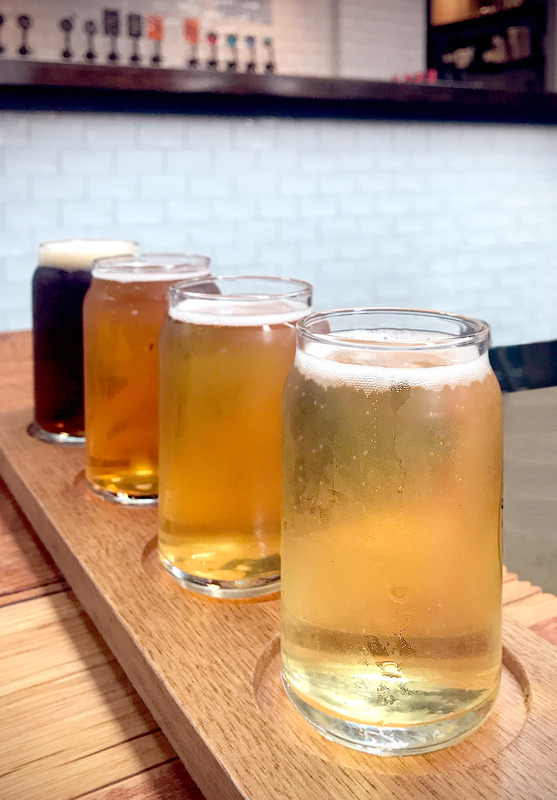 Now, this city has more breweries than you can poke a pool cue at (the list here on Broadsheet details some of the best brew bars in Melbourne), and Mountain Goat has been absorbed by Asahi, has wood fired pizzas and food trucks, and 13 brews on tap. Life is good. We had a bite to eat in Ms Elwood the other day (great food except for the pork belly), and I tried a Bad Shepherd Pilsner off their list. Cor, it was luverly, perfect with a bunch of spicy sour Asian flavours, and even better, we discovered their brewery with attached smokehouse is just down the road in Cheltenham. So, off we toddled on Saturday, man’s best friend in tow, for a bit of bitter and brisket. Bad Shepherd is run by Dereck and Diti Hales. Dereck is a self-taught brewer, who confesses to a sub-average beginning to the game, which only started to pay off about five years ago. He’s won a few decent awards now, and is particularly noted for his pale ale. 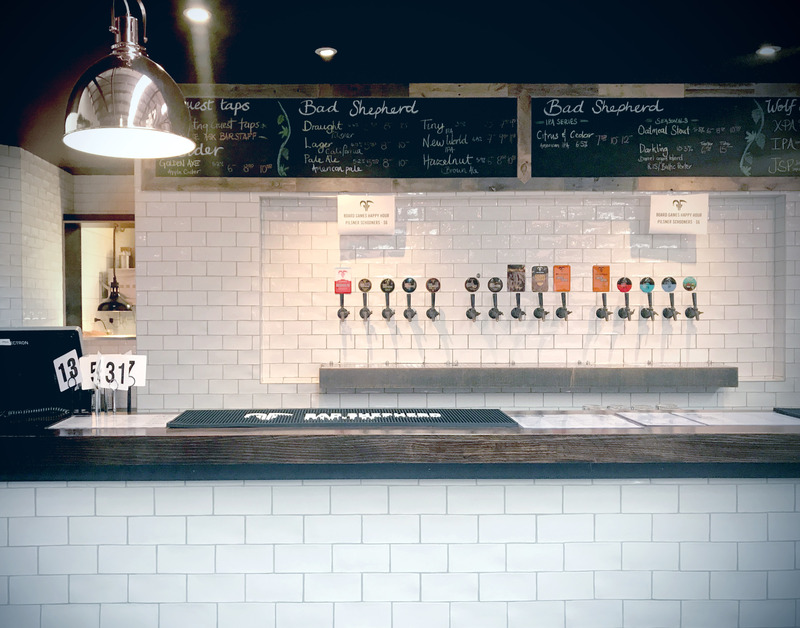 The brewing happens directly behind the bar – it’s pretty small scale, but provides more than enough to supply their own taps and support a healthy wholesale habit. The name is a little odd – apparently the Bad Shepherd is the one who leads his flock into temptation – and is a tongue-in-cheek poke at the unhealthy nature of fatty meat cuts, cancer-causing smoke, deep-fried nasties and of course frothy goodness. But in a city where other breweries are called things like “Bonehead”, “Fury & Son”, “Moon Dog” and “Tallboy & Moose”, I suppose it’s necessary to stand out, or at least look like you were on the sauce when you thought of the name. Unfortunately the smokehouse is only a part-way towards what it really needs to be to make me want to go back. The serves are pretty small, the brisket isn’t sticky or smoky enough, the pulled pork a little pale and lacklustre. Sides weren’t really that mind-altering, and I guess the ribs were OK, but with all the other mediocrity piling up (and a surly barmaid) it’s not really providing the home-style smokehouse coziness that this kind of venue needs to if it wants to be noticed. The beers however are definitely worth looking out for. That hazelnut brown has single handedly re-converted me to dark ales, something I gave up in the noughties after too many Newcastle hangovers (whatever possessed me?) – it’s nutty without being too bitter, malty but not too sour, full flavoured but still crisp, brewed with hazelnuts, vanilla extract and even Frangelico. The Reserve Road Draft Pilsner that drew me there was actually the weakest of the lot we tried, and it’s still a lovely little number. The American Pale Ale is fine, if a little summery for this weather – tropical hops, nicely bitter on the finish, but the New World IPA ticks the boxes for an autumnal afternoon if you prefer a crisp and bitter, hoppy brew, plenty of pineapple and pine characters and lovely golden amber colour. There are plenty of other options to try, including a well regarded Oatmeal Stout and even a Raspberry Wheat Beer, and as Bad Shepherd share the space with Wolf of the Willows (great XPA) it’s worth grabbing a tasting board if you want to work your way through the lot without being rolled out the door. So the verdict? Great beer and not at all BS, despite the brand’s initials. I took home several bottles for later (Hazelnut Ale, IPA and some WW XPA), and they’re just as nice as off the tap. But, as for revisiting the smokehouse, considering these are all stocked down at my local, and The Stomping Ground will let me bring my dog inside as the months grow colder, I’m thinking there might be better places to go for a feed.